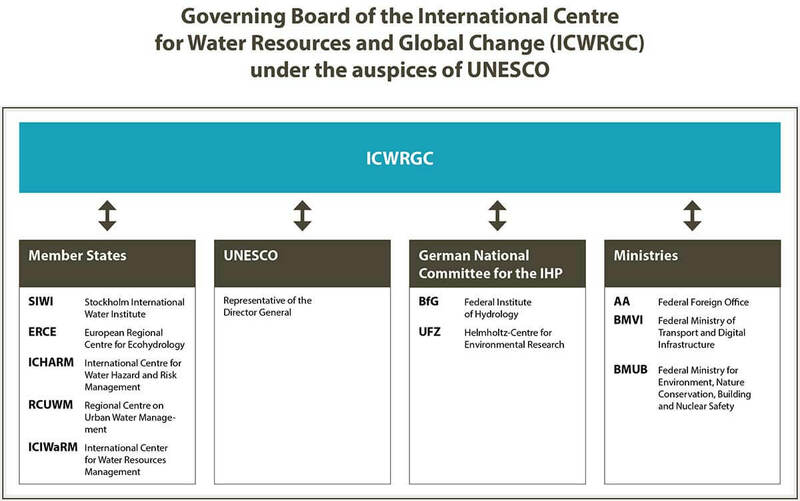 The ICWRGC works in close cooperation with partners from the scientific community, operational hydrological services, data centres and water-related UN-organisations. It supplies these partners with customised products for information, as a basis for scientific investigations, to improve operational skills, for policy advice and capacity development in the water sector. 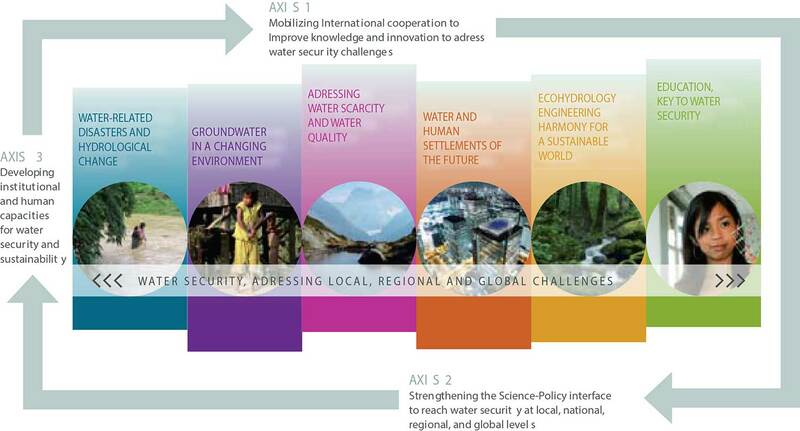 The illustration shows the six key issues of phase VIII of IHP: Water Security – Responses to Local, Regional and Global Challenges (2014–2021). The technical focus of ICWRGC follows the topics of the current IHP Phase VIII entitled: Water Security – Responses to Local, Regional and Global Challenges (2014-2021). The following illustration shows the six key issues of phase VIII of IHP. 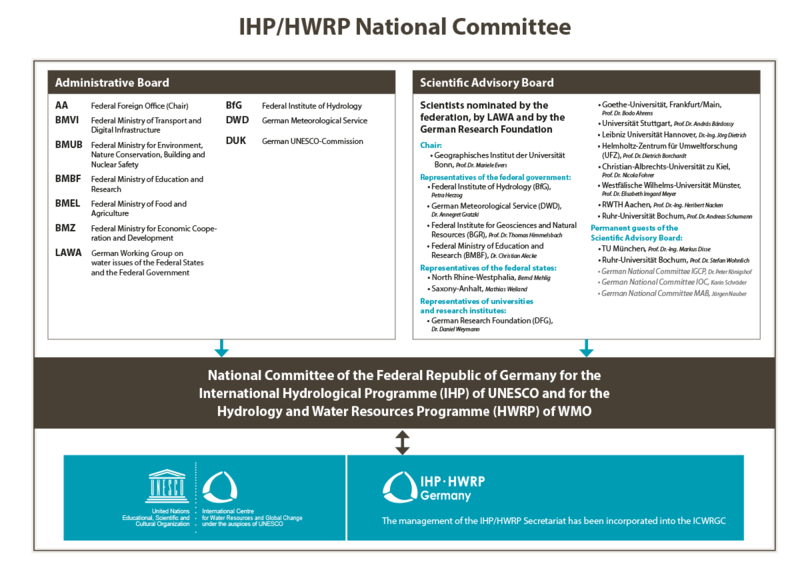 The German National Committee (NC) for the International Hydrological Programme (IHP) of UNESCO and the Hydrology and Water Resources Programme (HWRP) of WMO was founded in 1974. Representatives from Ministries, federal and Länder specialist administrations as well as experts from the fields of research and education are members of the National Committee. The National Committee that convenes once a year in Berlin, is chaired by the Federal Foreign Office. The working programme of the IHP/HWRP Secretariat responsible for implementing the NC’s resolutions is assisted by a Scientific Advisory Board. This Secretariat is incorporated into the ICWRGC. The Secretariat’s work is funded by the Federal Ministry of Transport and Digital Infrastructure, the Federal Ministry for Environment, Nature Conservation, Building and Nuclear Safety, and the Federal Foreign Office. The Centre is guided and supervised by a Governing Board, composed of a representative of the Government as the President of the Board; representatives of the German National Committee for the IHP; representatives of the funding organisations; a representative of the Director-General of UNESCO; five representatives of UNESCO Water Centres.